Electric guitar speakers are intended to be loud, yet most of them share an incongruous common trait: you can’t hear them. To be more exact, you can’t hear the mids and highs unless you’re directly in front of them- and sitting on the floor. That's because guitar cabs have very narrow dispersion in the mid and high frequencies. To compound matters they’re usually placed on the floor just a few feet in back of the player, so those directional frequencies pass around knee level. Even worse, to ‘look right’ beneath an amplifier that’s 20 to 24 inches wide, dual driver cabs place their drivers horizontally. This narrows the horizontal dispersion angle even more, and causes comb filtering in the highs. In an audio engineering course on how not to build a speaker the typical electric guitar cabinet would be around the top of the list. The simple solution is to vertically array the drivers, which would widen horizontal dispersion, eliminate combing and put the source closer to the player’s ear level, but the resulting tall, thin cabinet would ‘look funny’ with the amplifier overhanging both sides. Guitar players themselves have never had a problem with looking funny, but they do draw the line when it comes to how their gear looks. 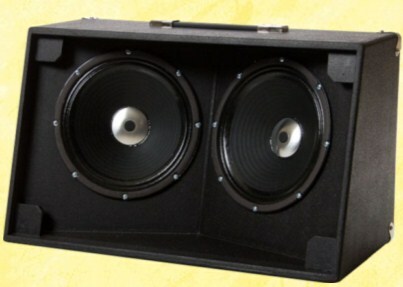 Enter Plan ‘B’: the cross-firing XF guitar speaker. The XF is available as the XF210 for two tens, the XF212 for two twelves, and the four driver XF410 and XF412. While many guitar cabs are angled back a few degrees, the XF210 and XF212 have a rear tilt of 15 degrees, while the taller XF410 and XF412 have an 8 degree rear tilt. With that much tilt-back you can actually hear what you're playing, even when you're only a few feet away from the cab. The drivers also cross-fire inward, at a 20 degree angle, shown in the cutaway cab view below. This minimizes the center to center spacing of the drivers for reduced combing, and widens high frequency horizontal dispersion by up to 40 degrees compared to a flat baffle. Guitar cabs tend to two varieties, sealed and open back, with most players having a preference to one or the other. To appeal to both camps the XF can be built with a removable rear panel that allows it to be either sealed or open with the flick of a latch. Plans are $14.95, delivered within 24 hours as email attachment in MS Word format. 13 pages, 8 photos, 28 diagrams. PDF version available on request. The comprehensive plans show you not only what tools to use but also how to use them. The XF 210, 212, 410 and 412 are four different projects. Be sure to indicate when ordering which plan you want. Can’t build your own? Contact the nearest authorized Builder for a quote.